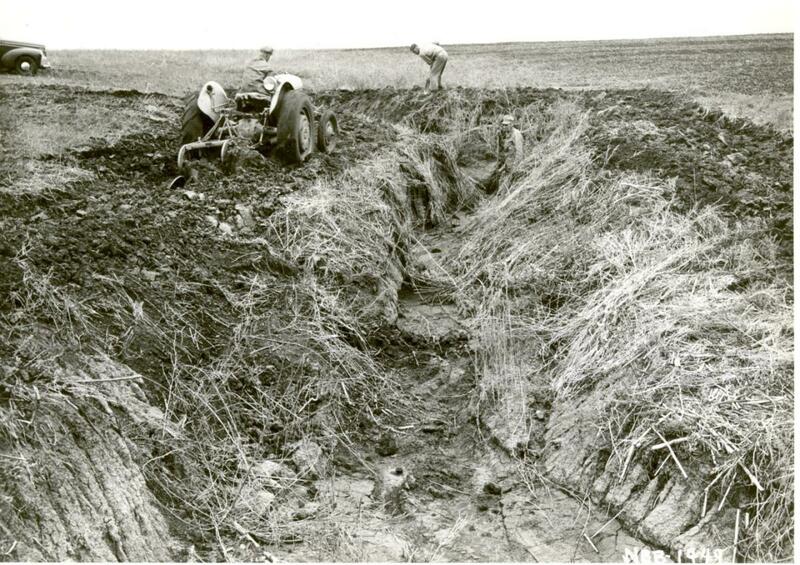 Badly water eroded field gully being filled in with Ford tractor for waterway. Tractor was in motion when picture was taken. 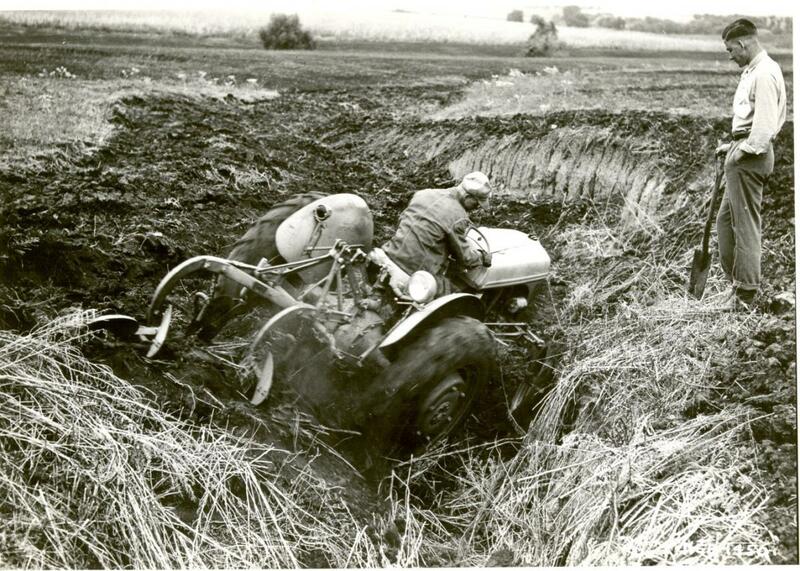 Head of gully in field being "worked in" with Ford tractor to make waterway. Gully is approximately 5' deep and 50 yards long. This was a test case with this little tractor. The gully was worked in all right. Civilian Public Service camp 106, Lincoln, Nebraska. 2-year old Holstein at Lincoln Agri. College, giving 65 pounds of milk per day. CPS Unit No. 106, an Agriculture Experiment Station unit located at the Nebraska Agricultural Experiment Station, College of Agriculture at the University of Nebraska in Lincoln, opened in May 1943. Operated by Mennonite Central Committee, the unit closed in October 1946. 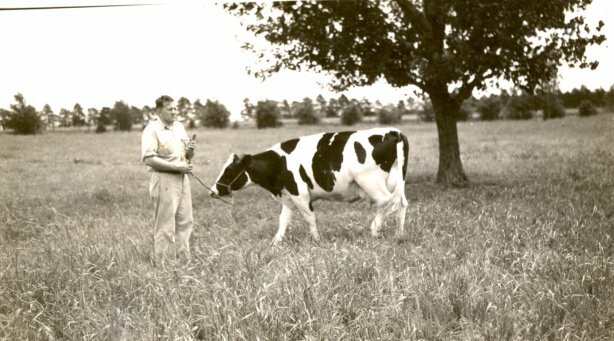 Men worked on farms and conducted research in dairy, agronomy, horticulture, animal husbandry, and poultry. This first Mennonite unit at an agriculture experiment station, opened at the College of Agriculture at the University of Nebraska in Lincoln in May 1943 after the station requested help from CPS for its program to increase food production. Some of the men in the unit worked in North Platte, Nebraska. While the unit was approved for thirty men, by October 1944 it had grown to thirty-nine. As part of its agreement with the Agriculture College, MCC recruited and carefully selected men from Mennonite camps. Some of the men were married, and their wives moved to the Lincoln area. The majority of men in Mennonite camps and units reported at time of entering CPS denominational affiliation with various Mennonite groups. The men performed farm work and research work in five departments. Six of the men worked in the North Platte station area. At the main station in Lincoln, five men each worked in the dairy division, and the departments of agronomy, horticulture and animal husbandry; four men worked in the poultry department. The men first lived in a large rooming house located at 1301 North Thirty-Third Street in Lincoln. When the unit grew in size, they moved into a large fraternity house at 3605 Holdredge, near the Agricultural College campus. The unit offered a farm and community school led by instructors from the Agricultural College and from “Mennonite colleges and churches west of the Mississippi”. Esko Loewen served as educational director of the school. The school provided courses and practical training for men planning to live and work in Christian rural communities. For information on Mennonite camps and units in agriculture, see Melvin Gingerich, Service for Peace: A History of Mennonite Civilian Public Service. Akron, PA: Mennonite Central Committee printed by Herald Press, Scottdale, PA, 1949, pp. 177-212.